Yesterday was the vernal equinox. And, like every year, I had such high hopes. I went to bed Saturday night, filled with promise. But I knew right away Sunday morning that something had gone awry. I laid in bed, listening to the tell-tale sound of a shovel at work. Once I established I was truly awake and no longer dreaming I went to the window for a final confirmation. Sure enough, I looked down to see my husband Mark clearing off the deck, the dog futilely trying to catch each shovelful of snow. I tapped on the window and gave a meek wave. This wasn’t at all what I had in mind for the first day of spring. But I could rally. It’s still the day when the earth miraculously straightens itself out and faces the sun dead on. And this excites me. We’re on the home stretch. The sun is finally starting its slow tilt towards the sun. An effort that can only lead to good things. I poured myself a hot cup of coffee, put on my boots, and went out to assess the damage. The world was white, cold, wet, and drippy. 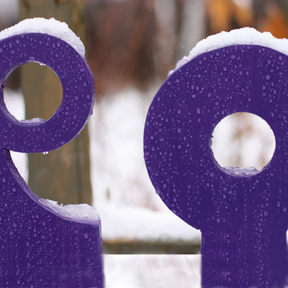 Searching for optimism, I wedged open the purple garden gate and stepped inside my sanctuary. 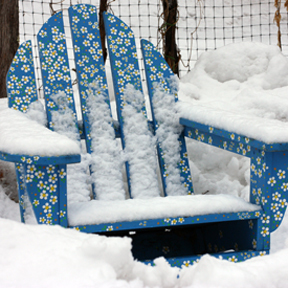 My favorite flowered chair (hand painted by my sister-in-law) was still sufficiently snowed into the corner of the garden. I took a seat anyways and gave things the once over. I spied the tip of a green onion that had more or less survived under a blanket of snow. It wasn’t completely full of life, but it was mildly reassuring to see something in that shade of green. The hand-cut dogwood sticks I use to mark the garlic rows were just poking above the surface of the snow. That was encouraging. I got up and went to investigate the parsnip bed. 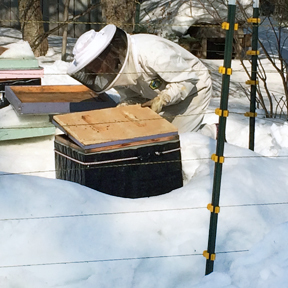 It was still covered with heavy blankets of snow and straw, but I knew the value of the jewels stowed beneath. I set off looking for other glimmers of hope, but the false crust of snow quickly gave way to my weight and my boots filled with what felt like especially cold snow. Enough of that. I retreated back inside. 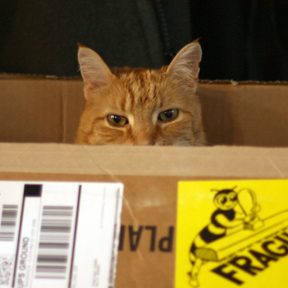 I found Hoops (our very wise cat) next to the wood stove, nestled deep into a box of bee supplies I had recently ordered. The two of us seemed to be on the same page. This day was clearly meant meant for cozying up. And baking. I wavered between some sort of elaborate tropical meringue with pineapple or mango or coconut – and something more fiery. I opted for the later. Partially because my pantry was lacking in the tropical fruit department, and also because I had just discovered we were out of eggs until this week’s local egg drop from Spirit Creek Farm. I found a spicy hot ginger cookie recipe that fit my mood perfectly. And bonus – no eggs required. The recipe is from Breakfast · Lunch · Tea, a cookbook from the Rose Bakery in Paris. It’s a lovely book, filled with inspiring photography and scrumptious recipes, all perfect for – you guessed it – breakfast, lunch and tea. I have overly ambitious plans of making a complete Rose Bakery brunch later this spring. We’ll see if I can pull it off. These cookies (or biscuits, to be more Brittish about it) are zingy and not overly sweet – my favorite combination. They are packed with the warmth of ginger and the cayenne adds a perfect heat that sort of hits you after you’ve swallowed. I’m glad to have a cookie jar full of these zesty treats, because from the looks of the forecast, the sun is just not tilting fast enough. A few recipe notes: I substituted a mild honey for the corn syrup the recipe originally calls for. The recipe also calls for 1 1/2 tablespoons of baking soda, which seems excessive to me. I scaled it back to 1 1/2 teaspoons. I didn’t have self-risng flour, so I substituted cake flour (which has a lower gluten content similar to self-rising) and added 1 teaspoon baking powder and 1/4 teaspoon salt per cup of flour. So about 3 teaspoons powder and 3/4 teaspoon salt. Lastly, I topped the cookies with a generous pinch of large grained raw sugar – which gives them an occasional extra sweet crunch. Blend the dry ingredients in a mixer for a few minutes to combine well. Add the cubed butter and mix until it is incorporated into the flour. 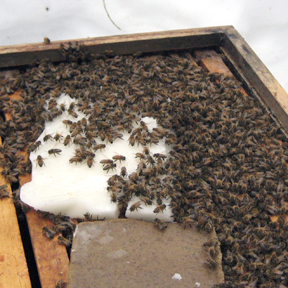 Gently warm the honey and molasses in a small sauce pan and add it to the flour mixture. Mix to form a stiff dough. Break off pieces of dough and roll them into 1 inch circles. Place on a parchment lined baking sheet and bake at 325º F for about 10 minutes. 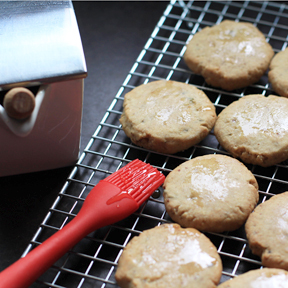 When the cookies are fresh, hot from the oven, give each cooke a pinch of raw sugar.